Freelance travel writing harbors its fair share of myths. Travel itself is alluring and adventurous. And travel writing conjures up all kinds of romantic perceptions: like sitting in your secluded beach cottage penning the perfect travel article. These faulty perceptions are often fused into a mythical fantasy. There’s a perception that you only need to (i) travel and (ii) write to become a travel writer. Although this sounds easy, it’s far from reality. Successful travel writers have lots of hustle. They sell multiple stories about each destination. They develop a network of magazine editors to tickle for repeat assignments, and they work the complimentary travel angle to the max to cover their expenses. 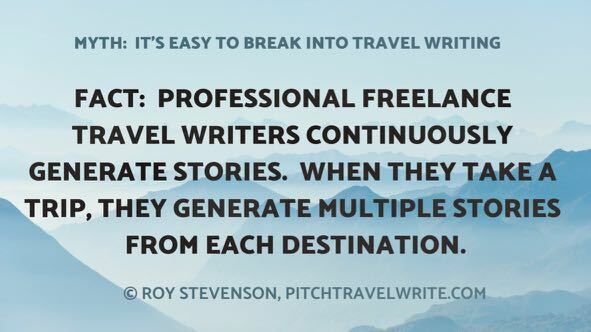 Professional freelance travel writers are continuously pitching stories. When they take a trip, they generate multiple stories from each destination. People who dabble in travel writing don’t last long in this game. It only looks easy from the outside. They soon find out it’s a real job requiring creativity, hustle and sales skills. If you’re an aspiring travel writer, you’ll need to work hard to succeed. You’ll need unique story angles. You’ll need to learn how to pitch your stories to editors. You’ll need to research and write your stories. And you’ll need good administrative and productivity skills to deliver your article on time and keep track of everything. Travel is the easy part. Don’t believe it. In fact, when you see this run the other way! 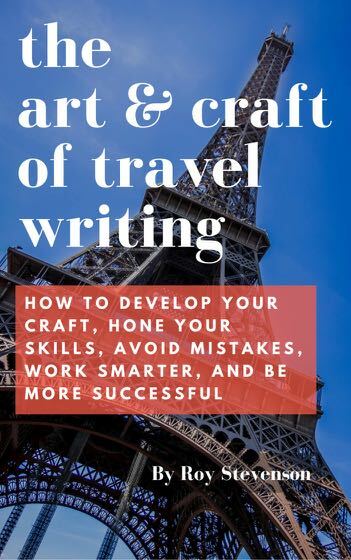 The truth is you do need to be a good writer to break into travel writing. You must be a capable writer to convince an editor to buy your stories. 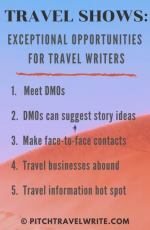 And you need excellent writing skills for the editor to publish your travel stories. Editors aren’t interested in helping you develop your writing skills. That's not their job. You have to produce good, error-free copy with a good story angle to get hired and get repeat business with editors. Creative writing skills can be learned. 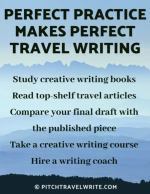 There are plenty of travel writing courses available to help you. You don’t need a college degree, but don’t be fooled into thinking you don’t need to be a good writer. If you’re pitching paying print media it’s assumed you have excellent writing skills. But superior writing skills will not automatically place you in an editor’s stable of “go to” writers. I've mentioned these things before but they're worth saying again. You’ll need to learn how to generate good story ideas. And you’ll have to learn how to sell your ideas to editors. You need to learn how to write a query letter that gets the attention of a busy editor. And you’ll need to deliver a high quality article, on-time to the editor. That’s four major skills beyond good writing. You need creativity, the ability to pitch and sell, and good time management skills. Without these skills, your travel writing career won't gain traction. Editors love writers who can present them with exciting story ideas and then deliver well written articles. Editors don’t have time for high maintenance writers. Consistently securing well-paying assignments takes a considerable amount of time. Sure, you can get lucky and make decent money with your first article. I know a travel writer who made $1000 on his first article. Then he hit a dry spell that lasted for almost a year. Developing “monetary momentum” takes time. Here’s how travel writers typically break in. Their first dozen or two dozen assignments pay small amounts, maybe $50-250 each. They develop contacts with editors and magazines. As they gain confidence they start pitching bigger magazines for assignments that pay more. Over time they focus on the better paying assignments instead of the small ones. Here's the key: If you pitch continuously you’ll build momentum. Once you’re established, staying in the game requires constant selling and writing stories. It’s like a conveyor belt. Most travel writers have several income sources. Travel writing is just one. In my book Rock Star Travel Writers you’ll see how each travel writer has many other streams of income. Travel writing isn’t an occupation where you can expect consistent paychecks. If that’s what you need, find a job with a steady paycheck. If you work at pitching and selling continuously, money will flow in. But it takes time to make it happen. Even when you think you’ve written the perfect story, it could be kicked back by editor for rewriting or for a new slant. And when you need to rewrite a story, do what the editor asks. Don’t argue. This will land you in travel writer’s purgatory, at least with that editor. Ignore your ego and do whatever the editor requests —that is, if you want to keep writing for that magazine. It’s also possible that the editor will rewrite or edit your story. The editor may or may not let you know it’s been changed. Don’t complain about this. Inevitably, your story will read better for it. Editors know what their readership likes far better than you. Learn from it. If you think print travel media runs on a tight budget, wait until you pitch stories to travel websites! You’ll be sorely disappointed with their payouts – if they pay anything at all. Very few website editors pay their writers, and those that do only pay token amounts, generally ranging from $25 - $200/piece. Website editors are struggling to earn enough to pay themselves. They can’t afford to pay 5-10 writers for each issue. On the other hand, the majority of print media pays writers, from about $0.10/word - $1/word, so you will earn from $150 up to $2,000 per assignment. You’re better off selling your stories to print media because they pay better, and they’re more prestigious. If you’re an aspiring travel writer, don’t be fooled by these travel writing myths. Freelance travel writing is a business and running a business requires a variety of skills and lots of effort. However, if you have the urge to become a travel writer, these skills can be learned. You’ll need persistence and patience, but you can learn the ropes and take the steps needed to succeed. 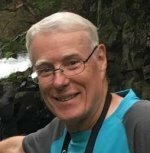 Browse this website (pitchtravelwrite.com) for lots of free information about how to get started.